Simplex Rapid Aplanat. Natürlich gibt es Exoten, wo auch wir uns den Kopf kratzen. Dann hören wir gerne auf Ihr Wissen. Gebraucht-Ankauf Wir kaufen Ihre Gebrauchtgeräte an! Eine Reise durch die EU dauert ca. Lens mount - I think it's A-mount - will accept regular C-mount lenses. Vintage Film Oil Can for VICTOR Movie Projector, a Bell and Howell company. Comes with cardboard box that says Victory Tool kit. Box is torn and has some tape on the inside attaching the loose pieces. But the money shot is the CAN!!! Beautiful signature graphics are neatly scripted and smaller letters stating its a Bell and Howell company in the front of the oil can. I have seen the little cans, but not with this detail. This can is about 20% full and measures approx. 3X1x1/2" Thanks for looking! Satisfaction guaranteed! 13 1/4" front to back and 10" height including handle. Light is approx. Model number is noted in the title. There is an extra bulb in the box. Case is Bescor and is 15 x 9 1/2 x 9 1/2". Not tested. Bausch Lomb - Rochester Optical shutter works smoothly - lens needs thorough in/out cleaning. Rear ground glass is fair - may not be original. Viewfinder needs cleaning, you can see in it, but it has a TON of junk that needs cleaning out. VICTOR 16MM MOVIE PROJECTOR LUBRICATING OIL & CAN IN ORIGINAL BOX. 3 FREE USED KODAK BOTTLES CORK HAS BROKEN OFF IN ONE BOTTLE. 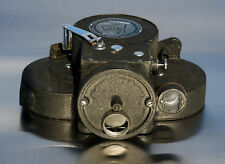 CORONET VICTOR, USES 127 FILM, WITH TATTERED BOX, STRAP, EMPTY SPOOL AND INSTRUCTIONS, WORKING, FACEPLATE AND TRIM PIECE FOR ADVANCE KNOB DETACHED, OTHERWISE LOOKS EX. We want you to be happy. You are responsible for them, and we do not know how much they will be. New with box= no bulbs or cord…. great for your collection…. Does not appear to have been used. Clean, in original box. However, my opinion and yours may vary since everyone judges differently. I am only human and do make mistakes. They may have slight defects, show wear, have discolored lining, small stains, odors etc. but I will try and list what I see to the best of my ability. The brown plastic and beige suede case with gold script lettering saying 300 S.L. (approx. ). It is a 650 watt bulb, so gets quite hot. Outside appearance of the lamp/light looks good also. The remote shows wear appropriate for it's age - I have not opened the case to see if batteries are inside. May or may not be fully functional. Service sets us apart. We have been family owned since 1914 and stand behind every sale we make. By Victor Animatograph Co. Davenport, IA. Sales are FINAL on ANY item that is listed "AS IS". We repair, refurbish, resale and recycle computer and electronics. Located near Bricktown at 1225 W. Reno Ave.